In addition to its beaches and climate, A Guarda also has a number of festivals with the months of August and September seeing no less than seven separate fiestas, some with an interest to the vacationer. Some of these festivals are religious, but today most are about having fun and focus on costumes and gastronomy. As well as the Castro at Santa Tegra, the municipality of A Guarda also has some other features worth looking at and amongst these are numerous religious buildings including a number of churches. These count the Iglesia de Santa Maria, the Convento de San Benito and the Capilla de Santa Trega, the latter being both very small and very old. 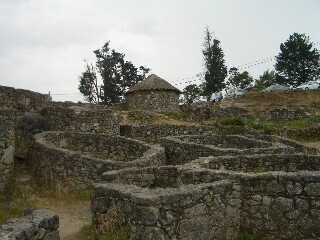 Civic structures of architectural interest include the casa de Torres and the casas indianas, as well as the Monumento O Marinrio. (This depicts the making and repair of fishing nets.) 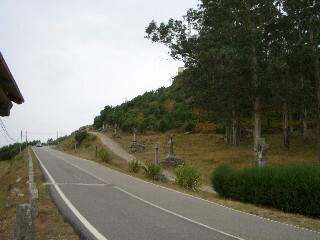 The Road of Crosses (see the photo to the left) adjacent to the Castro above the town is also popular with visitors. Finding a beach in A Guarda is never a problem with the district having half a dozen prime examples within a couple of kilometres of the main town. Area Grande is only a short walk from the town center as is Fedorento and O Carreiro. Other beaches require a short car journey of 2 or 3 kilometres. The beaches in this area tend to have fine white sand. As a tourist destination for non Spaniards, A Guarda is perhaps not the most historic or cultural of towns, nor does it posses the picture post card looks of a number of other similar potential tourist stop offs. That said, it sits perfectly at the foot of what a Galician would call a small mountain. It has the weaving path of the river Mino and the lush and fertile meadows and forests around it and the town itself is far from ugly. Perhaps the only negative is A Guarda’s distance and driving time for anyone based in Santiago de Compostela or la Coruna. This tends to make visiting it a full day trip rather than just a town to casually call in at. Above, the castro de Santa tegra is the feature for which many tourists visit this area. You can see and read more on the next page.